Ipe patios and ipe terraces are known for their superior characteristics and for the uncontestable beauty. Thanks to its extremely dense and tight grain, ipe wood offers both resistance and durability that is well appreciated by architects and designers. Additionally, the colour of ipe can run from a rich brown to an orange or reddish tint, and go well with all architectural styles. An ipe patio would be one of the most resistant exterior structures on your property. Its durability is attributable to its natural oils and to the density of this type of wood. This combination will help your terrace pass the test of time for the next 40 or 50 years. Preferred by many exterior arrangement designers, ipe wood is extremely resistant to weather conditions, humidity, UV rays, insects and mushrooms. 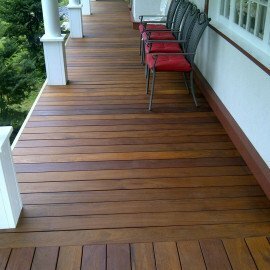 Ipe wood is ideal for patios and terraces, as it does not absorb heat, is scratch resistant and often recommended for high-traffic surfaces, such as outside walkways. Even if ipe is more expensive than other materials for patios available on the market, an ipe patio or ipe terrace would be a more worthwhile investment over the long term. You will pay more at the outset, but will benefit from a better price-quality ratio as your structure ages. In fact, an ipe patio will last twice as long as a patio made out of composite wood. If we take into account its unequalled durability and its minimum upkeep, this exotic wood becomes one of the most worthwhile choices for your garden arrangement. Ipe wood is 100% natural and ecological: it does not contain chemical products and is renewable. Additionally, its use is strictly regulated by organisations such as the Forest Stewardship Council (FSC) and the United States Green Building Council (USGBC). Companies using composite materials would like you to believe that their product respects the environment, when in reality its environmental impact is much more damaging. It is true that a certain percentage of the plastic that makes up the composition of the composite wood has been recycled, but when the terrace deteriorates over time, the material cannot be reused and will accumulate in waste dumps. On the other hand, ipe wood will last many more decades, and at the end of its life will be totally biodegradable.